The luxurious Hesperia Lanzarote is a fantastic choice for families and couples seeking a quality break in stunning surroundings. With a good selection of facilities all under one roof - including a state-of-the-art spa & wellness centre - whether you're looking to participate in the activities, relax or simply want to soak up the warm Spanish sunshine, this 5-star establishment is a great choice. Apart from the spa, other highlights of this hotel include an impressive lobby area, fine dining options, a choice of bars and four superb swimming pools. You'll be suitably impressed with the accommodation too. The hotel enjoys a marvellous seafront location next to the exclusive Puerto Calero Marina. There are plenty of lively nightly entertainment options – all within a short walking distance. 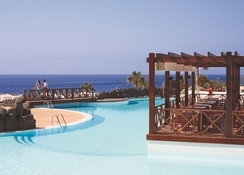 The Hotel Hesperia Lanzarote is only five minutes’ drive from the beautiful beaches of Lanzarote. The Playa de Matagorda Beach, which one of the most beautiful beach in Lanzarote is about 17km from the resort. The resort is also close to a golf course and many tourist attractions. The Lanzarote Airport is only 13.8km from the resort, making it convenient for the guests to board their flights on time. The guestrooms at Hesperia Lanzarote feature minibars and safes. They are categorized as Standard Room, Standard Room-4 People, Standard with View, Family Quadruple Room, Family Room, Family Kids Room, Suite, Suite with View and Terrace and Presidential Suite with View and Terrace. All the rooms come with a balcony or a terrace overlooking the sea, mountains or the gardens. Amenities of the rooms include air conditioning, Jacuzzi, bathrobe, bathroom amenities set, cable TV, in-room selection of pillows, extra bed upon request, free Wi-Fi, hair dryer, mini bar, pets allowed, safe, satellite TV, shower, sitting area, slippers, In-room service and much more. 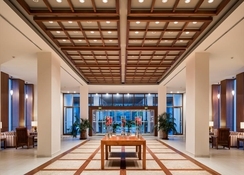 There are several food and drink options that the hotel has to offer for its guests. Every morning you can enjoy a huge buffet breakfast that comprises freshly cooked delights, fruit juices, etc. The hotel offers Botavara buffet for lunch and dinner that includes freshly prepared dishes from all across the world on a daily basis. If you are looking for something more romantic, then hit one of the a la carte restaurants: La Caleta and El Risco. If you prefer a casual environment, then head to the Drago bar or the pool bar, where you will find a range of choices. Or spend a soothing evening at the Piano Bar with live music, where you can sample finest range of beverages. Hit the Lanz Beach Cocktail Bar for post-dinner drinks. Follow the British tradition by taking a tea break right next to the Piano Bar and complement your cup of tea with sweet and savoury snacks. Go to the La Guayaba Bar for open air terrace and chill out with the freshly prepared cocktail. Guests can choose from four outdoor pools that are heated in winter. The hotel also features a squash court, tennis court, paddle court and beach volleyball court. Guests who want to maintain their fitness level can hit the gym, right next to it you will find the spa, where you can get yourself pampered. At the spa, you will find a menu of multiple beauty treatments and massages, it also offers a sauna and Turkish bath. If you want to see the latest sports in action, then the hotel’s sport zone is the right place to be. Apart from, this you can enjoy the best musical shows organized by the Nautilus Team. The little ones can also have fun in the children’s play area and the children’s swimming pool. turn this hotel into an Adults Only +18 hotel from the next Summer 01.05.19 contract. Friendly helpful staff, great food, all in all a top spot. Couldn’t have asked for a better holiday with my girlfriend. The hotel lived up to our expectations, with friendly staff, lovely rooms and great swimming pools. Would highly recommend anyone to take a visit to Lanzarote and Hotel Hesperia. This was without a doubt the best holiday we have ever had!! Ever. We loved it so much we already looking at going this year again. The food in the hotel was the best I have ever tasted! The variety was amazing. Something different every day. We went all inclusive so had breakfast lunch and dinner but the food was unbelievable! Hotel itself was excellent, great friendly people, and we’ve not had any problems during our stay. I stay at Hesperia last year and it was amazing. :friendly staff,fantastic service,good location,brilliant customer services team. If you want to go somewhere...this is it.The only minus is the beach(is a private one very small),but the hotel have 3 swimming pools.Also,the location is really good(10 min.walking to the shops ,restaurants ). This hotel is fantastic we stayed for a week and upgraded to all inclusive and worth every penny. The staff are really nice great for kids and the hotel it’s self is outstanding ready to go again! Absolutely lovely. Best holiday I’ve had for a very long time. Staff are very helpful and cheery. Great location. Lovely food. Pools a little cold but we did go at Christmas . Spa excellent. We had a great time at this hotel in August 2017. We got s free upgrade to a gorgeous suite with a hot tub which was so wonderful as this was a second honeymoon for us. The hotel is close to a marina and some lovely restaurants for food and a touch of boutique shopping. It is also just by the sea with small mini beach type set ups all around. The food was good and the hotel staff were excellent. I was especially happy with my pre order of a cake to our room for my husbands birthday being fulfilled despite me forgetting all about it on the day. I Would recommend it and stay again. We had a wonderful last minute week at the Hesperia after a really tough year! The food, room, pools, spa and service! I actually can’t wait to go back.